on the other side of racism. – sam finds faith. on the other side of racism. 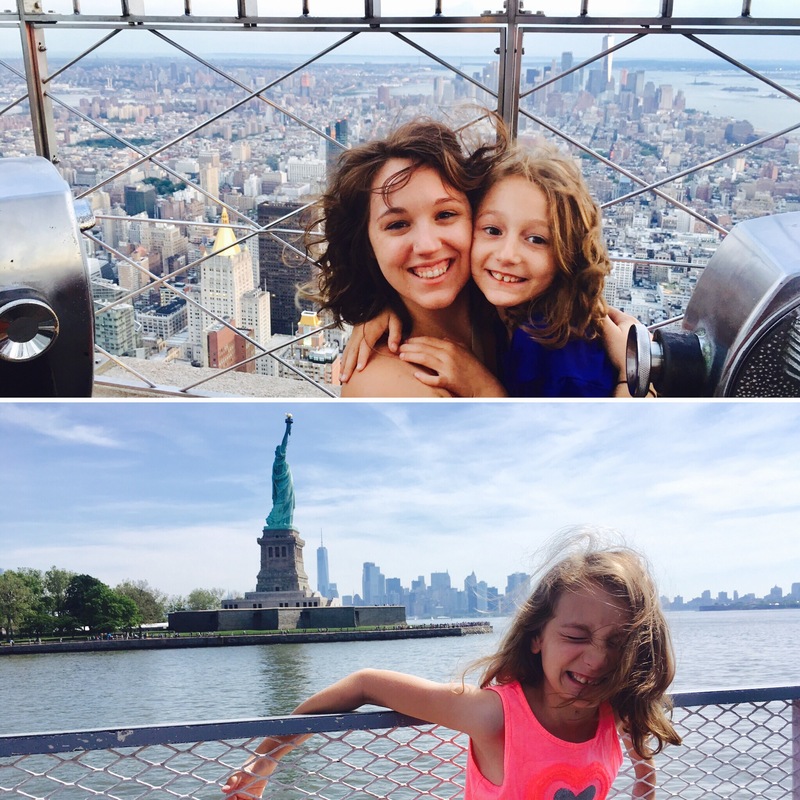 About a week ago, my mother and I took my 7 year old daughter to New York City on a trip organized by her school. I went to New York in 2014 and visited the city for a few hours one day, and ever since then, she’s been saying that seeing it for herself – most specifically, the Statue of Liberty – was on her bucket list. It’s an understatement to say that New York City has been a dream of hers and we were so excited to make it a reality this early in her life. It was a whirlwind weekend, my second in a row, but oh-so-worth-it when I saw her face at the top of the Empire State Building or in front of the Statue of Liberty. We were with a group obviously, but had a significant amout of free time Saturday night, so that when we took the elevator to the observation deck of the Empire State Building and to have dinner at Ellen’s Stardust Diner, which is on the edge of Times Square. If you’re at all familiar with these locations or areas, you know these things are not terribly close to one another. From our hotel to the Empire State Building to Ellen’s to our hotel, we’re talking about 45-50 blocks. With a seven year old. A seven year old who hates walking. It was an adventure (and I mean that both literally and sarcastically). Anyway, on our way back from the Empire State Building, we had to walk through a busy and beautiful Times Square just after sunset, probably around 8:30-9:00pm. There were people everywhere – it’s New York, we didn’t expect anything less – and we were just trying to truck our way through as fast as possible because my daughters will was fading. At one point, we cut acrossed the Sqaure from one side to the other so we could go down the right street to get to Ellen’s, and headed between a small shop and a barrier where a few young adults were standing. I say young adults, but it’s possible and likely they were between 17-20 years of age. When we passed through, they were in the process of changing positions, and we happened to pass between them in the cramped quarters against this barrier. My mom and I both spoke to them as we walked by and apologized, requesting pardon like most people do when you’re doing things like that. I was bringing up the rear in our single-filed line and so I made eye contact with one of these young men when he spoke up. He said to me, something to the effect of, “No I’m sorry. We’ll just get out of your way. Maybe we should give up our seats for you too.” His comments were dropping with sarcasm. I was afraid of harm, but I was scared. I was ashamed for doing, what I thought was, nothing wrong. A minor inconvenience mainly, but we were polite and apologetic. I couldn’t figure out why he would treat me that way. Me. I believe in white privilege and have been recently analyzing my life to find out how I can be more inclusive, live more a more diversified life, and tear apart indoctrinated stereotypes in my life, and the lives of those in my family and neighborhood. I abhor racism and am even willing to have honest and respectful conversations about race and diversity and white privilege. I’ve written about it here on my blog. My daughter, even. She’s seven. She’s tall for a seven year old, but she’s obviously a child. What could she have done to warrant such a response? It wasn’t fair and left me unsettled. But the more I thought about it… it WASN’T fair. It IS unsettling. And it was racist. He only said that to us because we were white. The parallel to Civil Rights Era racist etiquette was obvious, about giving up their seats for us, but it didn’t make sense because we were just passing through. The only purpose was to shame us for passing through their gathering place as if it was because we had no respect for them as human beings. But we do. I do. And that’s why I’m not mad about it. I’m not scared thinking about it anymore. I’m heartbroken. That young man is in an increadibly difficult season of his life. Young, black men his age are viewed as a threat by police and large portions of the general population at large (and probably a lot of white women like me) baselessly. This judgement is made just because he’s a young, black male, and that’s it. His formative years have followed the incidents in Ferguson with Michael Brown, New York with Eric Garner, Baltimore with Freddie Grey, Cleveland with Tamir Rice, and the list goes on. These are but a few names among many that most of us don’t even know because there weren’t “riots” or uprisings large enough or dramatic enough to be covered by the national news. This is his reality. He knows an entire different life than I’ve known. He might never have had a good experience with a white person. Or a police officer. His world view and his view of me is shaped by these things, which is incredibly unfair. It’s understandable, but it’s unfair. If he’d known me as a person, he’d know I have no judgement against him for any mistakes he’s made. He’d know I believe in the value of his life and in his humanity. He’d know that he’s one of many I pray for, that my heart hurts for, that I want to make a difference in my community for. But he doesn’t know that. He only knows that I’m white. I was hurt at the superficial judgement that had been made about me. But damnit – this is what happens to him EVERY. SINGLE. DAY. Is it right to treat me the way he’s been treated? No, and I don’t want to make excuses for that. I do believe that you should treat others how you want to be treated. But I cannot even imagine how it feels to grow up as a young, black male, and I will not minimize his experience and take away his right to be angry about this same kind of judgement being made about him day in and day out. Previous postfinding happiness in the face of sleep regressions and busy schedules. Next posttell me your story again.